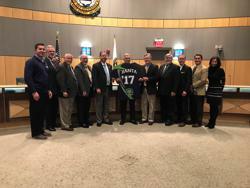 On January 29, 2019, Chairman of the DE Turf Board of Directors, William Strickland, along with Executive Director, Chris Giacomucci, had the honor of unveiling a new recognition program at the complex. Each year the complex will honor a champion for the facility who has exemplified dedication, passion and commitment to its success. The honoree will have their name retired on a jersey along with the year of that honoree’s selection. The jersey will be displayed prominently at the facility. The first year’s recipient is Commissioner P. Brooks Banta, President of Kent County Levy Court. President Banta played an integral role in the development of the facility, securing the land lease between the facility and the county as well as supporting the continued progress for the South Frederica Overpass. DE TURF recently completed its first full year of operations which brought over 102,000 visitors to Kent County as well as generated nearly 14,000 hotel room nights to Delaware’s economy.